Applications for students interested in joining Kellogg Community College’s 2017-18 full- and part-time nursing programs are available now. The application deadline for the full-time Nursing Program, which starts this fall and runs for four semesters (two fall and two spring semesters), is June 1. The application deadline for the part-time Nursing Program, which starts January 2018 and runs for seven semesters (two fall and summer semesters and three spring semesters), is Aug. 15. KCC prepares students for careers in the nursing field using state-of-the art, high-fidelity patient simulators in every Nursing course, along with comprehensive clinical experiences at health care facilities across Southwest Michigan. The College offers several opportunities for individuals interested in pursuing a career in nursing, including an Associate in Applied Science degree in Nursing, a Practical Nursing Certificate and Advanced Placement (LPN to Associate in Nursing degree) options to fit students with diverse needs and schedules. The programs are offered on a full- or part-time basis. 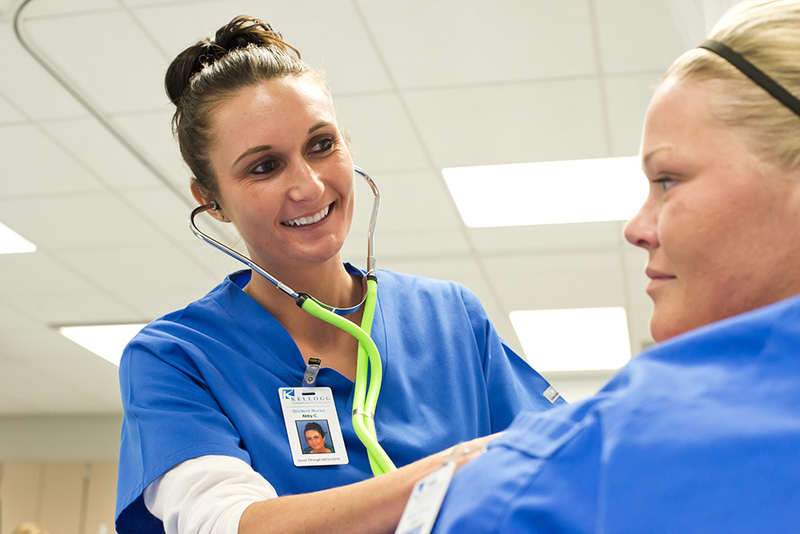 KCC is the only local associate-degree-level Nursing Program to offer a part-time option in addition to the traditional full-time model of instruction. The KCC Nursing Program is approved and authorized by the Michigan Board of Nursing and is a candidate for accreditation by the Accreditation Commission for Education in Nursing. KCC Nursing graduates consistently score well above the state and national averages on national licensure exams including the National Council Licensure Examination for Registered Nurses (NCLEX-RN) and National Council Licensure Examination for Practical Nurses (NCLEX-PN), and 2014-15 graduates reported a 92.5 percent job placement rate six to nine months after graduation in the College’s latest graduate survey. Admission to KCC’s nursing programs is selective due to space limitations, enrollment limitations imposed by regulatory bodies, and program admission requirements, and a limited number of applicants are accepted to the programs each year. Applicants seeking admission into KCC’s health programs must first fill out a general KCC application and complete the required courses for each program before submitting a program-specific application. For more information about KCC’s Nursing Program, visit www.kellogg.edu/nursing. For more information about admission to KCC’s Nursing Program, including links to applications and other important admissions materials, visit www.kellogg.edu/nursing-admissions. Additional information is also available by contacting KCC’s Selective Admissions office at seladm@kellogg.edu or 269-965-4153.